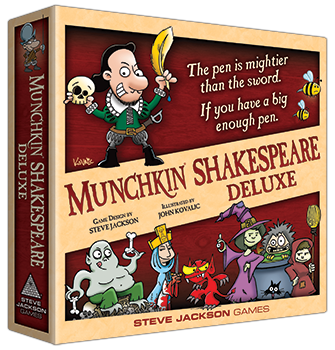 Daily Illuminator: Munchkin Shakespeare Preorders Close Today! April 17, 2017: Munchkin Shakespeare Preorders Close Today! It's time to shutter the off-off-Broadway production of Munchkin Shakespeare! Preorders close today, so head over to BackerKit now to reserve your copy (and the Kickstarter-exclusive expansion!). If you are a Kickstarter backer, make sure you have submitted your BackerKit survey, as well! We hit a lot of milestones this past week, including the Kill-O-Meter, Drama Dice, and Demo Pack going to print, as well as Munchkin Shakespeare itself making it out of the production realm into prepress. If this all sounds a bit foreign to you, you can check out Andrew Hackard's article on our review-and-approval process for games over on Medium. It gives a concise rundown of how a game like Munchkin Shakespeare goes from an idea to a physical product. Once the game ships to backers this September, you can expect to see it on store shelves, as well. Speaking of stores, if you are a retailer interested in ordering Munchkin Shakespeare, please contact our Retail Liaison so we can make it happen. Retailers can also get the Kickstarter-exclusive expansion. But those orders also close today, so reach out as soon as possible! Reserve your own copy of Munchkin Shakespeare today, along with the extra swag and exclusive expansion, while you still can!